^ South Africa Will Play Two Anthems Hereafter. The New York Times. New York: 10. 3 June 1938 [31 October 2018]. ^ travelfilmarchive. 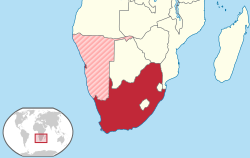 The Union of South Africa, 1956. 8 November 2012 –通过YouTube. ^ darren lennox. British Empire: The British Colony Of The Union Of South Africa 1956.. 23 February 2017 –通过YouTube. ^ South Africa Act, 1909, Part V, sections 68 to 94..
^ South Africa Act, 1909, Part IV, sections 19 to 67. Beck, Roger B. The History of South Africa (Greenwood, 2000). Davenport, Thomas, and Christopher Saunders. South Africa: A modern history (Springer, 2000). Eze, M. Intellectual history in contemporary South Africa (Springer, 2016). Robinson, G. G. The Prospects of a United South Africa. The Empire and the century. London: John Murray. 1905: 521–538 （英语）. Thompson, Leonard. The Unification of South Africa 1902 – 1910 (Oxford UP, 1960). Welsh, Frank. A History of South Africa (2000).